Psychology majors at Northwest learn the scientific study of a person’s thoughts and behaviors. Northwest faculty help students understand three core areas: scientific research methods that enhance critical thinking skills, evidence and claims knowledge; insight of an individual’s personal behavior, motives and thought processes; and the understanding of the biological and social factors that contribute to human development, cognitive skills, relationships and personality. A minor in psychology teaches students the fundamentals of cognitive, developmental and biological psychology, the psychology of personality and social psychology. After taking the required courses, students can customize their minor from a list of approved electives. For a list of required courses, visit the academic catalog. This minor requires the completion of 24 credit hours. Students and faculty developed the #IWILLLISTEN Campaign in 2015 to raise awareness about mental health in a practical, safe and social environment with professional, community and campus support. Social Science Research Group (SSRG) is a student-led research project that works together with professors to design research projects, collect data, analyze the results and present data at the Great Plains Psychology Conference. The traditional program may be a semester, summer or year-long program and is taught by Northwest’s international partner institutions. Students from the business school have recently traveled and studied in China, Africa and Eastern Europe including Hungary, Austria and Czech Republic. Although internships are not required in the psychology major, they are highly encouraged to gain hands-on, real-world experience. This fall I was an intern for the New Beginnings Counseling Center in Maryville. It was an opportunity that I never imaged I would have. I worked with substance and alcohol abuse clients monitoring individual and group-counseling sessions. This is a picture of me and my fellow intern, Courtney (Northwest graduate) jumping into Mozingo Lake for our polar plunge to raise awareness for mental health and substance abuse. We raised more than $700! When I finished the internship, I received my certification as a recognized associate substance abuse counselor, second level, RASAC II! I had the opportunity to study abroad for more than five months in Graz, Austria. The last trip I went on before leaving was to Hallstatt, Austria where this photo was taken. I was in awe with the beautiful scenery of mountains and lakes, combined with the adorable and historical city nestled in the center of all of it. This city is so beautiful. In fact, it is replicated in a province of China called Guangdong. 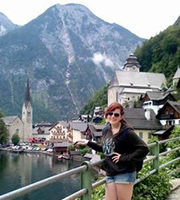 Hallstatt is one of the many beautiful places in Austria and I feel very fortunate that I was chosen to study there.